I had a bad cold and when I get sick and stuffy I want Thai food. 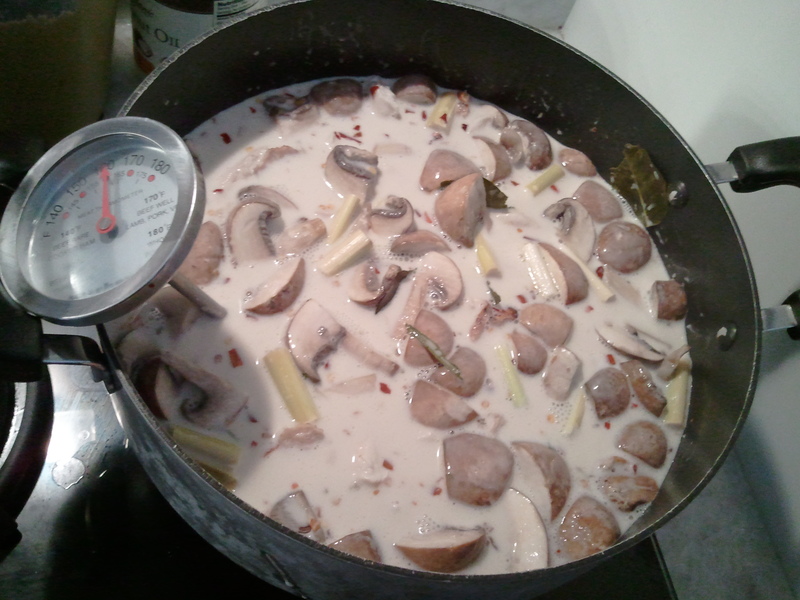 The best ever Thai food blog is shesimmers.com, which is where I found this recipe for Tom Kha Gai. Of course I modified it a bit based on availability of ingredients, but you won’t be disappointed. The soup is filling, a little sweet, a little salty, and a little sour. In my opinion, you can serve this as an appetizer or as an entree, depending on your portion size. 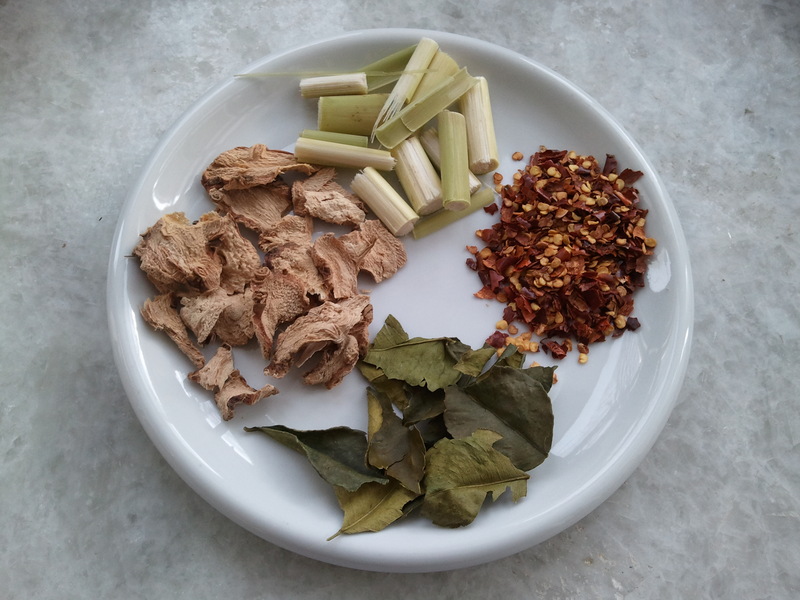 Leela (shesimmers.com) abhors dried galangal and Kaffir lime leaves (and anything else dried for that matter), but that’s what I had available and I think it still worked just fine. The chicken stock has to be sodium-free or your soup will end up tasting like a salt lick. For mushrooms, you have a few options – button, cremini (a.k.a. “baby bella”), straw, or oyster. You can use canned straw mushrooms but I would not use any other type of canned mushroom. 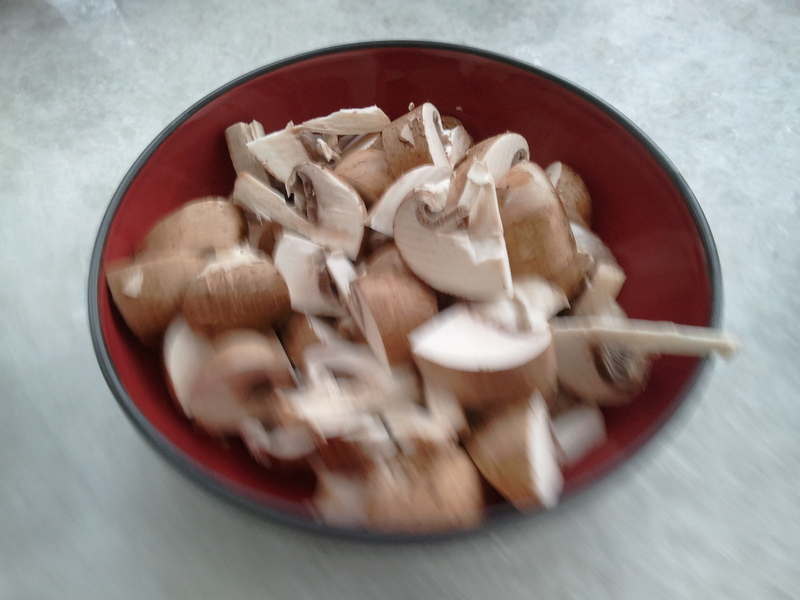 Do not use shitake (too strong of a flavor) or big portobello mushrooms (will discolor the soup). For the chicken, I trimmed the thigh meat from the bone into thin slices. I also cut the breast meat into thin slices. Save the thigh bones though – you’ll add those to the chicken stock for extra flavor. For straw mushrooms, you can leave them as is. They’re already bite-sized. For button or cremini mushrooms, halve or quarter them into bite-sized pieces. Cut the lemongrass stalks into 1 inch pieces and smash them with something heavy (fun!). I used a meat mallet (smooth side). Halve the limes and juice. Pick the cilantro leaves from the stem, but don’t chop. Do them same for the basil. Slice the Thai chilis down the side but don’t actually halve them. This allows the heat to come out the chili and into the soup. Set everything aside. Time to cook. 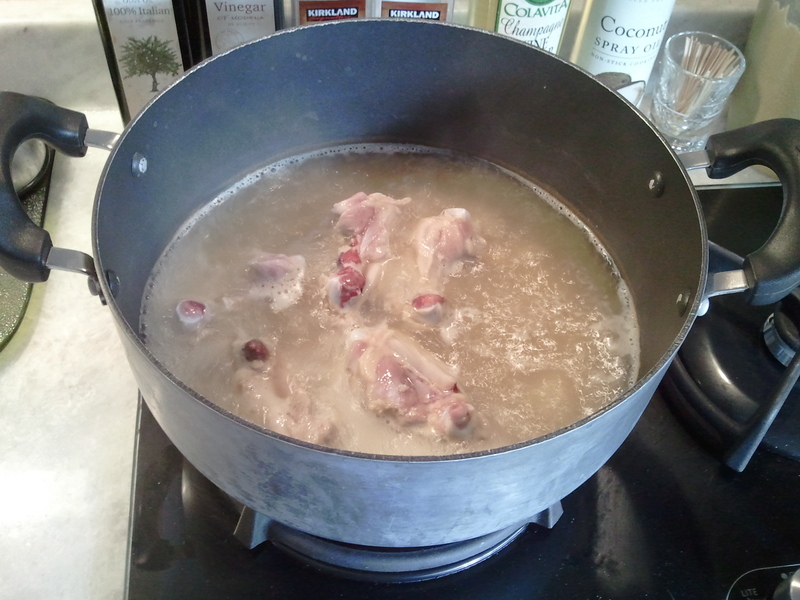 First, concentrate the chicken stock in a wide and tall saucepan – think saucepan for making a lot of soup. Add the thigh meat bones. Bring the broth to a boil and reduce over medium-high heat until the volume of the broth is halved. If you start with 4 c. of broth, you should end up with 2 c. of broth once it’s cooked down. 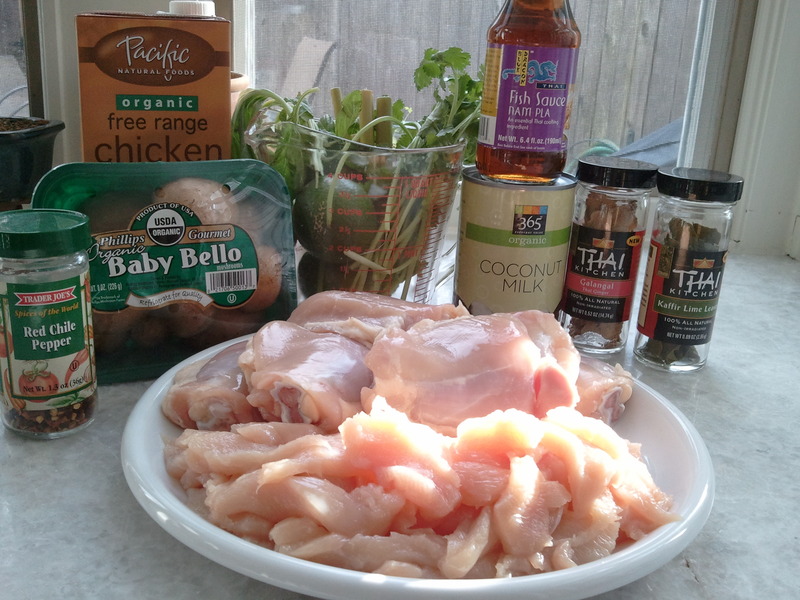 Add the coconut milk, water, Kaffir lime leaves, lemongrass and galangal. I also added the red chili pepper flakes here. Slowly bring the mixture to between 160F and 180F, this allows the herbs to infuse into the liquid. I actually used a thermometer to monitor the temperature. Keeping the temperature steady, add the mushrooms and chicken to the saucepan. The liquid should not come to a boil at any point. Cook until the chicken is thoroughly cooked. This doesn’t take long because the chicken is thinly sliced, maybe 10-15 minutes. Stir occasionally. Once the chicken is cooked, add the Thai chilis and remove the saucepan from the heat. Add the some of the lime juice and fish sauce. 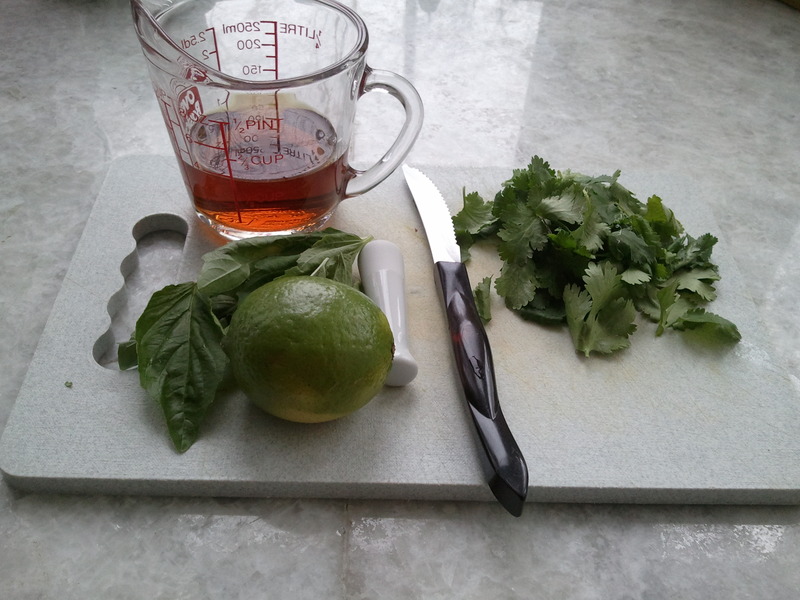 Stir and taste, adjust the amount of lime and fish sauce you add according to your preference. 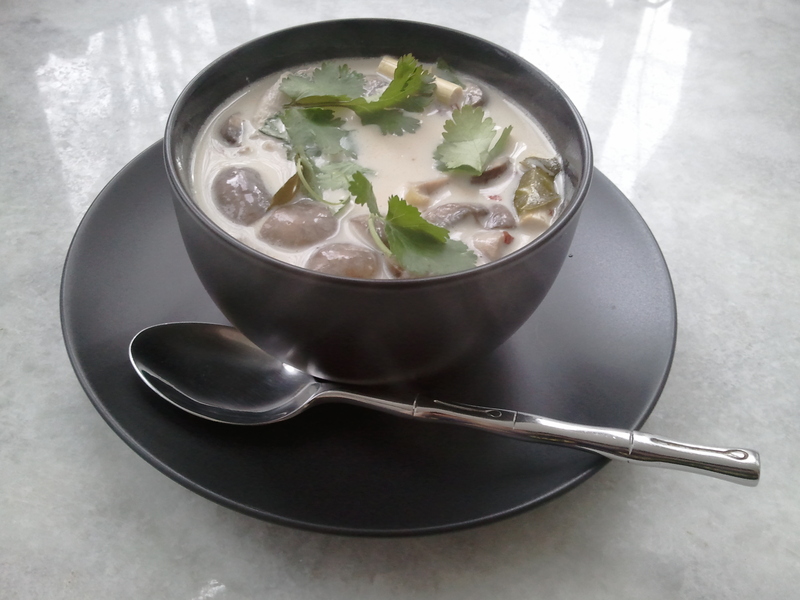 I like my Tom Kha Gai really limey, so I added a lot of lime juice. If you don’t like salty food, you may want to decrease the amount of fish sauce that the recipe calls for. Finally, stir in the fresh cilantro and basil and serve. This entry was posted in appetizer, chicken, main dish, soup and tagged chicken, chili, cilantro, coconut milk, fish sauce, galangal, lemongrass, lime. Bookmark the permalink.